Tony Bellew says Oleksander Usyk "will learn to lose"
By Scott Gilfoid: Tony Bellew says his opponent Oleksander Usyk is going to “learn to lose” on Saturday night when the two of them face each other in their much anticipated bout at the Manchester Arena in Manchester, England. Bellew’s high degree of confidence is so extreme that he’s got a massive amount of boxing fans believing he’s about to hand the unbeaten IBF/WBA/WBC/WBO cruiserweight champion Usyk (15-0, 11 KOs) his first defeat of his short 5-year pro career. This is exatly how Bellew behaved before his fight with Adonis Stevenson in 2013, and he had the world believing he would win that one too. Unfortunately thing didn’t work out for Bellew, as he was knocked around the ring five six rounds by the more talented Stevenson in losing by a 6th round knockout. But with Bellew’s promoter Eddie Hearn downsizing the talent of his opposition, he’s done surprisingly well in beating guys like Illunga Makabu, David Haye, Arturs Kulikauskis, Ivica Bacarurin, Valery Brudov, Mateusz Masternak, Nathan Cleverly and Julio Cesar Dos Santos. “He’s amazing at what he does, but he’s going to learn to lose on Saturday night, and learn he will do,” Bellew said to skysports.com. “This is a test of wills. How much do you want it mate, because I want it more than you. I don’t care how much, I want it more than him. I’m just hoping I can drag this fight into a place where we have to find out who wants it most. That’s what I’m hoping I can do,” Bellew said. The way that Bellew is talking, he sounds like he’s going to try and make the fight a war. Bellew has never really had any real wars during his career other than his first fight against Nathan Cleverly. Neither of Bellew’s fights with David Haye were wars. Bellew stayed on the outside for most of those fights until he came forward took advantage of Haye’s injuries to his shoulder and Achilles. In Bellew’s fight with Makabu in 2016, he was knocked down. It wasn’t until Makabu backed up against the ropes that Bellew landed a flurry of shots that caused the referee to step in and stop the fight. That fight was hardy a war though. Further, Bellew’s fights against Edison Miranda, Isaac Chilemba and Ovill McKenzie weren’t wars. None of Bellew’s fights during his career were ever wars, which makes it difficult to take him seriously when he talks about his match against Usyk being a war. The fact is, Bellew is going to likely try and box Usyk for most of the fight on Saturday night. At times, Bellew will open up with some shots hoping to knockout Usyk or at the very least win the rounds, but he’s not likely to succeed at either. Bellew might win some rounds due to the fight taking place in Manchester, England, but in the real sense, he’ll be lucky if he wins even one round in the fight. Usyk is just a much better overall fighter than Bellew, so trying to box him will be a comlete waste of time. The only thing Bellew can do to try ad win the fight is if he stands and tries to slug it out with him. That might be a mistake too, because Usyk can punch with almost as much power, and he’s faster and throws more punches. 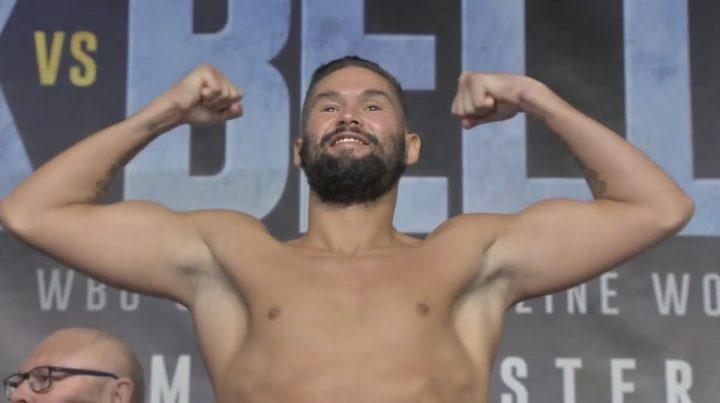 If Bellew was as good as he thinks he is, then you have to ask the question why hasn’t he been fighting the best fighters in the cruiserweight division in the last four years instead of fighting guys like Masternak, Bacurin, Dos Santos, Cleverly, Makabu, Kulikauskis and Brudov. Those are not among the elite in the cruiserweight division. One would think that Bellew should have been fighting much better fighters than those guys if he truly sees himself as the best in the division. Usyk’s size, southpaw stance, high work rate, mobility and boxing skills are going to prove to be a big riddle for Bellew to solve on Saturday night in their fight on Sky Box Office PPV and DAZN. Usyk looked sensational in capturing the World Boxing Super Series tournament earlier this year, and he’s now facing a 35-year-old fighter in Bellew, who has decided that he wants to end his career while he’s still in his prime more or less. Bellew’s rationale for wanting to retire after this Saturday night is because he feels he’s going to take so much punishment in the process of trying to win the fight, it’ll leave him depleted for continuing his career. Some boxing fans believe the real truth being that Bellew doesn’t believe that he has enough talent to beat the other top dogs in the cruiserweight division. If Bellew wasn’t set to retire, he would need to fight Mairis Briedis, Yunier Dorticos, Murat Gassiev, Krzystof Glowacki, Denis Lebedev and Maxim Vlasov. Some or all of those fighters might beat Bellew, and expose him as being a fighter that was never as good a boxing fans thought he was. In other words, the fans will figure out that the only reason Bellew was winning previously because his promoter Eddie Hearn was matching him against the weaker cruiserweights and not the better ones. If Bellew wanted to have a real legacy, he would stick around and fight the best in the division and not simply walk away after a loss to Usyk. Bellew wants to gloat if he beats Usyk on Saturday in the same way he gloated after his last two wins over 38-year-old David Haye in 2017 and 2018. The difference here is Usyk isn’t old, inactive, injured and hobbled with physical problems that will keep him from winning the fight in the way that Haye was against Bellew. Usyk isn’t a fringe level fighter like most of the guys that Eddie Hearn has been matching Bellew against since he moved up from the light heavyweight division to cruiserweight in 2014. Hearn is a skillful match-maker. He’s good at making his Matchroom Boxing stable fighters look better than they actually are. For example, look at how Hearn is matching Kell Brook and Amir Khan. Instead of seeing Brook fight talents like Jermall Charlo, Jarrett Hurd, Erislandy Lara and Jaime Munguia at 154, you’re seeing him matched against Michael Zerafa and Sergey Rabchenko. Those are both lower level fighters. Instead of Khan being put in with Errol Spence Jr., Shawn Porter, Terence Crawford and Danny Garcia, you’re seeing him fighting Samuel Vargas and Phil Lo Greco. Hearn has been doing the same thing with Bellew by matching him soft, but you can argue that the casual boxing fans don’t know enough about the sport to understand he’s been doing. Hearn has helped Bellew’s career by making him look good, selling his fight to boxing fans that otherwise wouldn’t have bothered buying them if he had been matched against nothing but the quality fighters at cruiserweight for the last four years instead of the weaker guys that Hearn has been feeding him. “When I do it, I don’t want to hear ‘We’re all shocked, I don’t want to hear ‘It was luck,’ I don’t even want the credit. I don’t care. I just want to get off and leave. I just want to go home,” Bellew said in sounding bitter. Bellew sure does sound like he has a major chip on his shoulder. If he wanted to prove the boxing public wrong about them seeing him as a limited slugger than has been pampered by his promoter, then he should have started fighting quality fighters years ago instead of being satisfied with the guys that Hearn has been matching him against.